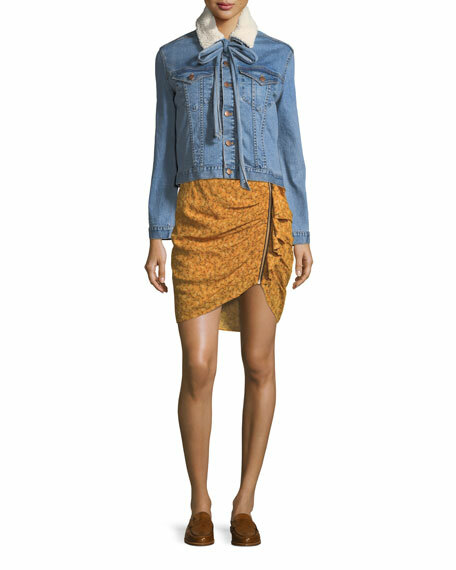 Veronica Beard "Spencer" ruched, floral-printed skirt. Sisters-in-law who share a name and an eponymous brand, Veronica Swanson Beard and Veronica Miele Beard melded backgrounds in finance and fashion to launch in 2010. Their brand is built on dressing women Monday through Friday in the sort of sharp, smart separatesdresses, tops, trousers, jackets, and morethat carry over into the weekend. These 2013 CFDA/Vogue Fashion Fund finalists bring their own personalities to the collection: Swanson Beard possesses a classic sensibility; Miele Beard lends an eclectic edge. For in-store inquiries, use sku #2294744.